↑ Lee, Jennifer (January 16, 2008). "Solving a Riddle Wrapped in a Mystery Inside a Cookie". The New York Times. สืบค้นเมื่อ May 10, 2012. ↑ Lee, Jennifer 8. (January 16, 2008). 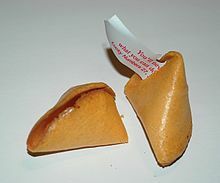 "Fortune Cookies are really from Japan". The Fortune Cookie Chronicles. Archived from the original on 2011-07-25. หน้านี้แก้ไขล่าสุดเมื่อวันที่ 14 กรกฎาคม 2561 เวลา 04:04 น.